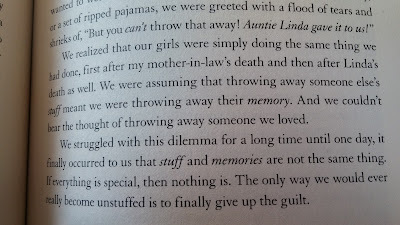 the Japanese gal who wrote the book whose title I can never remember makes a corny point about "saying goodbye" to items, and thanking them for their service to you. It's totally corny and slightly too hippie, and frankly, kind of creepy, but... it worked for me. Also her explanation that a gift from someone doesn't cease being a thoughtful sentiment from that friend even if the gift isn't something you like, want to keep, or find useful. 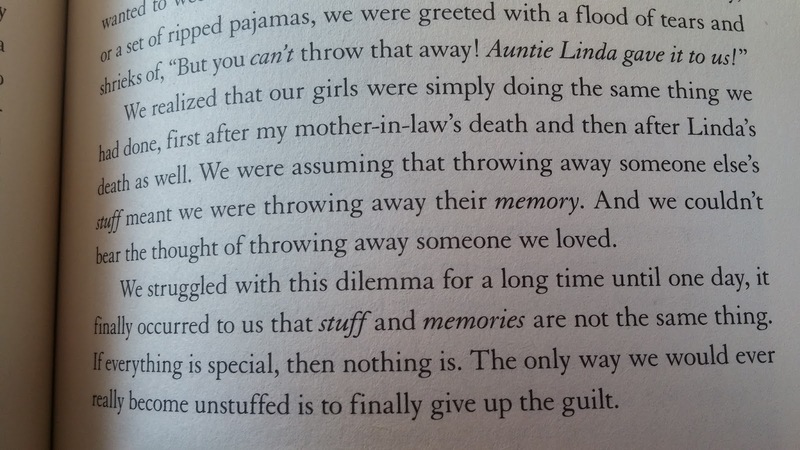 Don Aslett's book on clutter said something similar. He said the point to a gift is to show the person that you care, that you're thinking of them, that you want to give them joy. So if they give you a cute stuffed animal, you are free to enjoy it for as long as you might enjoy a bouquet of flowers or a pair of movie tickets. I am trying to declutter the basement. Right now it's very hard for me. I'm feeling a lot of uncertainty about the future. And that gives me the Depression-era level of "but we might NEED that later!" If things seemed more sure and steady, I would feel okay about getting rid of encyclopedias and relying on the Internet. If I felt confident about being able to buy food at the store, I wouldn't feel as much need to hang onto emergency supplies (stocked pantry, seeds, meat grinder, grain grinder, tools for cooking over an open fire, etc). And there are so many other examples. Yes to both of your comments. Those paragraphs are helpful to me, Jane. You know how I am about getting rid of anything that was Grandma Beery's - and now your Wicked's. Oh, my. But I think what you posted will help. Thanks!